The Boeing 777 family of aircraft currently has two main passenger versions plus a Boeing 777 Freighter version. Two main passenger versions are the Boeing 777 200 and the Boeing 777 300 variants. Although their air-frame measurements such as wingspan, wheel track and tailplane are the same, the major difference is the fuselage length. The Boeing 777 300 is significantly longer than the Boeing 777 200 by 10 metres. This gives an appreciable additional passenger load that can be carried. The Boeing 777 300 was the longest airliner in the world until the introduction of the Airbus A340 600. 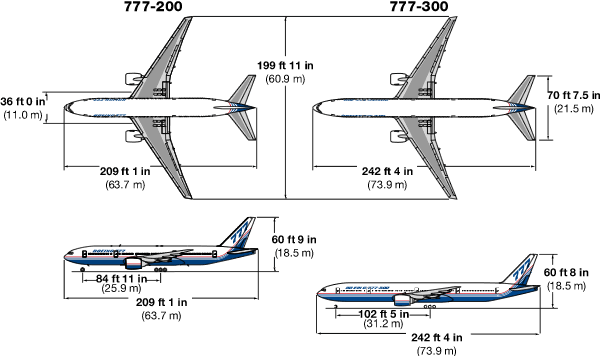 Boeing 777 Shorter range variant dimensions. Boeing introduced longer-range versions of the Boeing 777 200 and Boeing 777 300 in response for airline demand for this aircraft to service long-haul intercontinental routes. On 12 December 2011, Boeing received ETOPS 330 approval for the: Boeing 777 200LR, Boeing 777 300ER, Boeing 777F and Boeing 777 200ER equipped with General Electric engines. This means that these aircraft are certified to fly over water provided they can fly to the nearest available suitable landing spot in under 330 minutes, flying on one engine only. 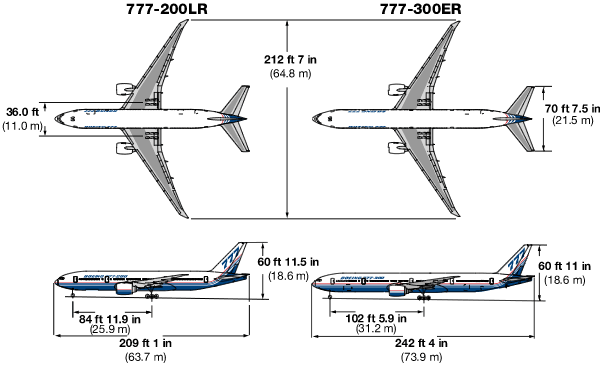 Boeing 777 longer range variant dimensions. Boeing 777 cabin sample cross-sections. What are the FedEx 777’s FS2 and FSD based on ? Hi Richard, you pose a very interesting question and I am trying to track that down for you now. I will come back with an answer as soon as I can. Best regards Peter. What is the seat height of the boeing 777. Not the height of the backrest, the height of the actual seat from the ground to the top of the seat where your bum sits? Good question Jeanne. I must admit I have not been able to find the answer to that one. You have plenty of information about pitch, which is the distance between seats one behind the other and width from armrest to armrest. Seats are manufactured by various suppliers, even for the same aircraft type, as it is the airline customer who chooses these. I’m sure there is some standard and if someone else knows this please feel free to weight in with your knowledge. Hi, i just wanted to Ask if you have any information about the 777-200f? Just wondering. Thank you for stopping by. As much as we would like to cover everything, at this stage we will concentrate on passenger aircraft. Having said that, I know we have delved a little bit into the Boeing 747 8F freighter but this more out of respect for the Queen of the Skies transitioning from a mainstay airliner into a modern freighter. Hi, is there a way to find out what the height is from the floor of the cabin to the ground when the Boeing 777 is on the ground? That is a great question, particularly if one was required to vacate the aircraft in an emergency. You can see why air slides are a necessity as the height above the ground is significant. So in answer to your question, there are several things to consider. Most aircraft when on the ground don’t sit exactly horizontal, normally you’ll find they have the tail slightly higher than the nose which means the floor slopes down to the front. The other thing to consider is whether the aircraft is fully laden or empty. Just like your car, if it is full it will ride further down on its suspension and therefore be lower to the ground. Considering this, let’s look at the measurements taken from the fore most cabin door and those for the rear most cabin door of the Boeing 777 for a fully laden state and an empty state. As you can see there are significant differences between fore and aft as well as empty and full. Do you have movies on board the Boeing 777-200/200ER? Are there outlets for your IPad’s, cell phones. Good question. The answer is yes, all those things are possible. The question revolves more around whether the airline who buys the Boeing 777 wants to provide those services to their passengers. An airliner is seen by the airline simply as a tool, one that will enable them to make money by carrying passengers and freight. When an airline buys an airliner, they already have worked out what kind of routes they will fly it on and what market they are targeting. What difference does that make? Well, if you used your 777 to fly a short commuter route you might decide that you will just order a high density seating bare bones cabin configuration. The aircraft is in the air a short time so who cares about movies etc. If the 777 flies on longer routes, then offering movies, internet and personal device charging points becomes much more important. Business travellers will demand it and will soon choose the airline that provides these facilities. So as you can see, there is no yes or no answer. It comes down to what the airline feels they need to offer to be competitive. What is the wingspan area for 777-200ER? For the Boeing 777-200er the wing span is 60.9 metres while wing area is 427.8 metres. What is the seat pitch on Air France’s long haul Boeing 777-300ER planes Economy class (10 seat configuration) ? Do they have movies ? Thank you for stopping by. When you say 10 seat economy, I am assuming that you mean 10 across. The configuration on the Air France 777-300ERs is 3-4-3 which means 3 seats together on each window side and 4 across the middle making 10. The seat pitch is 32 inches which is the distance between the seats front to back whilst the width of the seats is 17 inches between arm rests. Each seat has its own personal entertainment system screen so that movies and other video entertainment can be enjoyed. Just aware that the box driving these systems is located under the window seats, so the could be less storage space under those seats. We have booked a flight at a boeing 777-200 and we are in line 35 seat a,b,c. Is it possible for the seats to lay back or not? How exciting. The ability for seats to recline depends very much on the airline. You may have read recently that airlines like British Airways are removing the ability for seats in economy to be able to recline. There is little space these days between the seats in economy, so even if the seats can recline it is becoming accepted practice not to recline. Passengers seated behind you appreciate you not doing so. For whatever it’s worth I found a PDF document that may allow you to answer some of these questions. It’s Boeing document D6-58329-2, available from http://www.boeing.com/assets/pdf/commercial/airports/acaps/777_2lr3er.pdf. In fact, Boeing has an entire airport compatibility section on their website (http://www.boeing.com/commercial/airports) that has a lot of useful info. Thank you for sharing these links. Yes this PDF is certainly a great source of more in-depth information. I’m sure our readers will find lots of useful information here. – Frankfurt / Mumbai / Frankfurt. Also approximate flying times between these lanes. the maximum payload available on the B777 freighter is 653 Cu Mtr(23,051 cu ft)37 pallets. Now, whether they can carry that full payload will depend on several factors. Firstly, the length of the leg they are flying. If it is long flight then some of the payload may have to be sacrificed in the interests of carrying more fuel. Secondly, weather conditions play a part. The temprature and air pressure at the point of take off particularly, plays a large role in determining the lifting capacity on the day. High tempratures for example produce poor lift conditions, so a lesser payload might have to be considered. Altitude particularly, once again for the point of departure, is a factor. The higher the airfield the thinner the air so the lifting capacity is once again compromised. For the city pairs you mention, this should not be too much of a factor as the highest of the three airports you mention, Frankfurt, is 364 feet above mean sea level. Frankfurt – Mumbai 7 hours 55 minutes. Hi, Do you know the tail height of the B777-10X? we are gathering the details for the 777-10X which seem to still be hard to get. I believe the tail height of the 777-10X will be around 3 feet higher than the 777-300ER which is 19.47 Meters or 63Feet 10Inches. We will be updating the table as soon as we can get some hard and fast specs. The aisle measurement i can not find it any where. It would be lovely to know it as they say this space is getting smaller ..on the 777 Boeing.thank you Michelle . 10 seats -abreast: 2 aisles x 17″ + 10 seats x 15.7″ = 191″. Hi! I was wondering if there is anywhere I may be able to find the pylon dimensions for the 777-300. Thanks! Thank you for stopping by our 777 site. That’s a bit of a hear scratcher that question and I must admit we haven’t been able to track that information down yet. Will give it some more thought. being a larger aircraft, the Boeing 777 300ER tends to ride turbulence better than smaller ones. The secret, however, to reducing turbulence though, when possible, is of course avoidance. Modern weather radar and sensors provide information to the pilot much more accurately than in the past and this can then allow the pilot to make better-informed decisions about routes and the avoidance of weather that might produce severe turbulence. It is not always possible to avoid on some routes. Around Singapore you often find cumulo-nimbus clouds reaching high altitudes and air traffic control requirements allowing, the pilot will be able to navigate around these. On the way to Auckland, you will also cross over the ITCZ (Inter Tropical Convergence Zone) or the doldrums. This can be an area of intense cloud activity but once again your pilot will have the equipment on-board to alert him/her to the smoothest route option. Relax and enjoy your flight. What is the datum distance and track of main undercarriage of B777-800? I don’t believe that information has been released yet as the aircraft is still in testing. The first major joins of the first test aircraft were made in September 2018 with the maiden flight expected this year, 2019. See our 777X page for further details. Hi, I can´t find in any place the maximum payload, just the capacity in volume. Do you have it? Thank you in advance. Hi, thanks for your question. I am assuming you are talking about the volume of freight that can be carried under the floor of the aircraft. I believe we have that covered this in the row entitled, Maximum Freight Capacity. Here, for example, you can see that the 777-200 has a capacity of “162 Cu Mtr(5,720 cu ft)32× LD3”. Perhaps I have misunderstood your question.